Aligarh: Professor S R Hashim, Chairperson with the Institute of Human Development, Giri Institute of Developmental Studies and Indian Association of Social Science Institutions—IASSI delivered the ‘Sir Syed Memorial Lecture’ on ‘Sir Syed Ahmad Khan: A Visionary with a Mission’ at the Department of English, Aligarh Muslim University (AMU). The lecture was organised by the Sir Syed Bicentenary Celebrations Committee and the Department of English. Prof Hashim discussed about the early books written on Sir Syed including the first biography, ‘The Life and Work of Sir Syed’ by George Graham and Altaf Husain Hali’s ‘Hayat-e-Javed’. He pointed out that there are numerous volumes on Sir Syed’s life and work, which have been examined by many scholars. “One cannot even pretend to make a fundamentally new point, yet some aspects of Sir Syed’s life and works need to be chosen and repeated, if necessary to pay tributes,” he said. Prof Hashim said that Sir Syed lived in a century of fear and despair and the conditions worsened after 1857. He pointed out that there was a state of mind, which kept people away from new developments, education and modernisation at that time. “It was in this era of darkness that Sir Syed brought a new light by standing courageously,” said Prof Hashim. He added that Sir Syed made people walk on a path for a better future through education and new ways of thinking about modern developments, science and technology. “Sir Syed’s Asbab-e-Baghawat-e-Hind was a daring attempt telling the British Government that the revolt was not a religious war but its main cause was the neglect of the people of India and their sentiments by the rulers,” said Prof Hashmi adding that the book received sympathetic attention even from the British Parliamentarians. He further pointed out that Sir Syed had a humanist temperament and a feeling for all people irrespective of caste, creed and religion. “Sir Syed looked at things in a broader and secular perspective and the development of science and technology made an impression on him,” said Prof Hashmi pointing out that this was Sir Syed’s vision when the country was bogged down in medieval ways of life. AMU Vice Chancellor, Professor Tariq Mansoor thanked the eminent speaker for accepting the invitation. He complimented the Department of English for hosting the lecture. Prof Mansoor said that Sir Syed built the university on the pattern of Oxford and Cambridge. 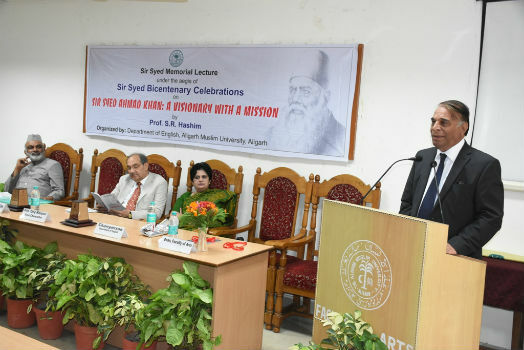 The Vice Chancellor pointed out that Sir Syed’s bicentenary celebrations have been taking place in AMU and other places for the past one-year. “Public meetings in various cities have been taking place to pay tributes to Sir Syed,” said Prof Mansoor adding that the celebrations will conclude on October 16, 2018. The Vice Chancellor attended the function as the chief guest. In the welcome address, Prof Seemin Hasan (Chairperson, Department of English) said that the momentous occasion takes into account the depth and richness of Sir Syed’s contributions. “As we look forward to another century of achievement, we invest pride in being chosen to host the memorial lecture,” said Prof Hasan. She also said that that the department is honoured to have Vice Chancellor as the chief guest while assuring a constant participation in the endeavour for taking university to greater heights. Prof A R Kidwai (Director, UGC HRD Centre and Director, K A Nizami Quranic Centre) was also present on the occasion. Dr Vibha Sharma conducted the programme, while Dr Ayesha Munira proposed the vote of thanks.